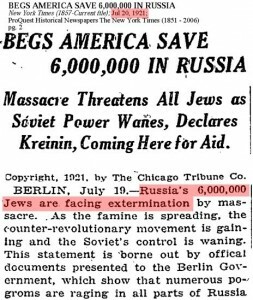 As documented in the book The First Holocaust, the Zionists have continuously and hysterically attempted to claim that six million Jews were dead, dying or in grave danger in Europe and Russia since the late 1800′s. Any time there was turmoil in Europe, albeit turmoil often instigated by Jews in the first place, prominent Zionist figures and Jewish-controlled media organizations world wide continuously whipped up a frenzy with phony sob stories to get people to feel sorry for Europe’s Jews and donate money to Jewish charities. 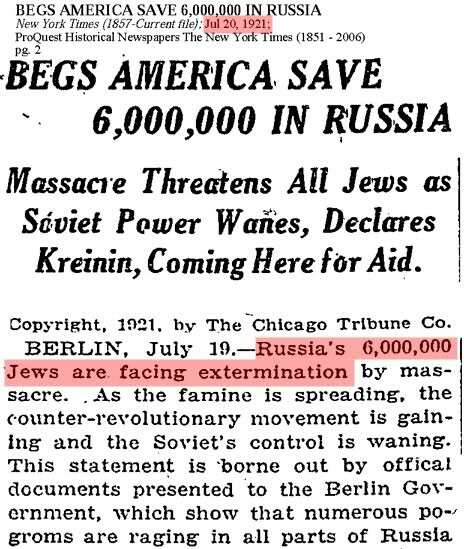 It turns out that this mythical six million figure, long since discredited even by mainstream Holohoax historians, comes from a Jewish-Talmudic religious myth that says “ye shall return minus six million” or “you shall return to the land of Israel with six million less”, and of course WW2 birthed the modern state of Israel which was established in 1948. Israeli Jews often excuse their systematic genocide of Palestinians and many and theft of Palestinian lands by bringing up the so-called Holocaust™ of WW2, which any serious researcher and critical thinker knows by now is a fraud of collosal proportions. The Zionists have so much influence that they turned a delusional Jewish religious prophecy into “historical fact”.